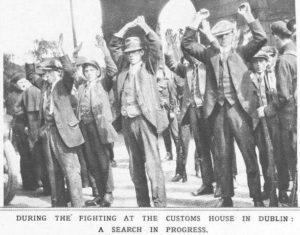 When Daniel McAleese arrived for work in the Custom House on 25 May 1921, he had no idea he would witness one of the major events in the fight for Irish Independence. Daniel`s account of the Burning is very important as we get the view of an innocent bystander caught up in all the mayhem. He shows great respect for the Volunteers and does not paint them as corner boys or thugs, which some historians seem to do these days. Also, he shows the brutality shown towards members of the public by the Auxiliaries, who are also now being made respectable in some quarters of revisionism. Here is what happened in Daniel’s own words. “Around 1 p.m. on that memorable day in May 1921, I was lunching as usual with three Civil Service colleagues in the dining room of the Custom House. This room was situated on the ground floor convenient to the Beresford Place entrance. There were about a dozen other diners in the room at the time as well as the manageress and one or two waitresses. The table at which I sat was furthest from the door partly facing the door and the counter behind which the manageress was engaged. My colleagues and I had already partaken of a first light course and, while waiting for the next, were engrossed in conversation. Suddenly, the normal tenor of the room was disturbed by loud and determined voices from the direction of the door shouting “Up, Up, Up”. I looked towards the door and saw that three young men had entered the room with pointed revolvers and had ordered all the occupants to put their hands up. All in the room complied with this order. With our hands extended above our heads we were marched out in single file to the corridor where we joined a number of others both of the staff and the public. Meanwhile, several young men passed us carrying tins of petrol. One of the leaders announced that the Custom House was being set on fire and warned us against causing any commotion. The crowd in the corridor grew as the upstairs rooms were vacated by the staff. At an early stage, I inquired from one of the leaders whether we would be permitted to return to our official rooms to recover our coats or other private property. After a short consultation with one of his men, he announced that we would be given five minutes for this purpose, but added that anyone who acted suspiciously or who tried to take away official documents would be summarily disposed of. I raced upstairs to my room where my colleague had remained at work until I should return to relieve him. “Bill”, I shouted, “get your hat and coat quickly. The I.R.A. have raided the building and are about to blow it up”. Bill was a phlegmatic young man and thought I was perpetrating a joke. Nevertheless, he looked up, nibbling the end of his pen between his teeth, and inquired what I was talking about. At that very moment two armed men entered the room carrying petrol tins. One of them covered us while the other proceeded to work on the windows. I explained that permission had just been given to us downstairs to return to our room to obtain our private belongings. Within a minute, Bill and I with our possessions left the room hurriedly and raced downstairs towards the Beresford Place entrance door. Here were assembled all the members of the several staffs, one D.M.P. man in uniform, together with members of the public who were engaged on business calls in the Custom House when the raiders entered and who were not permitted to leave. The crowd was a mixed one, male and female. Everybody was frightened and nobody knew what was happening outside as the exit was barred. Occasional reports of rifle or revolver fire could be heard and some of the womenfolk became very restive. The position inside worsened quickly as smoke from the upper rooms began to billow downstairs. The upper rooms were now heavily on fire and as the thickened smoke descended to our congested quarters in the corridor, the atmosphere became almost unbearable. There were shouts and screams to open the door. At this stage there was heavy machine gun and rifle fire outside The crowd inside now became panicky; hysteria raged. Caught between smoke and fire inside and incessant gunfire outside, the crowd kept clamouring to get outside. As the smoke and fumes became almost overpowering, the Volunteers tried to quieten the people, telling them that all would be well and that they would shortly be allowed to leave. This advice was of little avail as the smoke drenched downstairs in an unending column, accompanied by the crackling of burning woodwork. It is impossible to envisage how the crowd of half demented individuals would have acted had the double danger to their lives continued. Almost imperceptibly however, the, gunfire outside decreased in volume, Being further away from the exit door, I did not actually hear the orders given, but the door was unblocked and the women folk led the way out of the building. As I had already taken my private property in a small attache case from my room, I now remembered that I had a bicycle which I had left in the building a few yards away from this particular exit. I managed to lay hands on the bicycle and then joined the tail-end of the queue as it emerged into the open. Being semi-blinded by smoke, it was a few seconds before I glimpsed the scene outside. Those in front of me had their hands up and, as we descended the few steps into the foreyard, there were five or six Black and Tans covering us with rifles and revolvers. Fifty yards or so further away, i.e., at the junction of Gardiner St. and Beresford Place, there were several armoured cars as well as numerous soldiers kneeling with their rifles trained on us. In my efforts to put my hands up and, at the same time, hold on to my bicycle and attache case, I stumbled down the steps. Immediately, one of the Black and Tans shoved a revolver into my ribs and threatened to shoot me. I struggled up and followed the tail of the crowd which was heading in the direction of Upper Abbey Street. I passed several dead civilians on the way. Just as I got under the railway bridge a heavy fusillade opened up. All of us dropped to the ground and sought shelter between the cobblestones. For at least five minutes (or so it seemed) the armoured cars and machine guns pumped bullets towards the exit from the Custom House, which we had just left. There seemed to be a crossfire as if bullets were passing in both directions over our heads. Presumably this heavy firing was occasioned by the Volunteers emerging from the Custom House in an attempt to fight their way through the military lines. The firing gradually subsided, but members of the Black and Tans, in a kneeling or stooped position, with guns drawn, mingled with our crowd, threatening to shoot if they saw the slightest movement. Indeed, there was one incident where the worst might have happened. Beside me lay a young man whom I had never seen before. I could just raise my eyes, not my head, sufficiently to see him shuffle his hand to his coat pocket. He took out a box of cigarettes and got one to his mouth. As he was in the act of lighting the cigarette, a Black and Tan rushed over and poked a gun in his neck, swearing that if he moved a muscle he would blow his head off. The young man’s answer was to blow a whiff of smoke from his cigarette into the face of the Black and Tan. In the jittery condition of everyone, this was certainly defiance. Shortly after this, a member of the staff, who was in a very cramped position beside one of the pillars of the railway arch, moved ever so slightly in order to improve his posture. A Black and Tan spotted the movement and, rushing across, threatened to shoot him if he made another move. The Civil Servant, a man of senior rank and, no doubt, hoping to mollify the angry armed man, said: “Do you know who I am? “I’m the S R”. The Black and Tan savagely retorted: “I don’t’ care if you are the Pope”. As this Civil Servant, a non-Irishman, was well known for his loyalist sympathies, the treatment he received must have evoked amongst his colleagues many silent smirks. The firing, which had become somewhat sporadic, finally ceased. After a short interval, heads which had been pressed as close to the paving stones as it was possible for them to be, began to move, to rise and to turn around. The tension was easing. 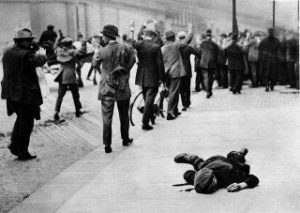 A Black and Tan appeared with a bottle of whiskey in his hand and inquired whether any one was wounded. “Here”, exclaimed a civilian whose face was ghostly white and whose addiction to an occasional glass or two was his besetting weakness. “Here”. The Black and Tan advanced with the bottle and handed it to the man who proceeded to drink as if the contents were water. The Black and Tan kept eyeing the civilian, then snatched the bottle and, looking at it ruefully, with a half curse intended to be a joke, said: “I hope any others are less seriously wounded”. After a further spell, during which cigarettes were lit and the crowd on the ground adjusted themselves to a more comfortable attitude, an officer appeared and announced that a thorough search of each member of the crowd would at once be made. He directed that each person would remain seated as he was until his turn came to be searched. The searching would take place in pairs with hands above the head, and any person who made any suspicious movement or tried to dispose of anything in his possession would be drastically dealt with. This Auxiliary officer, accompanied by a Black and Tan, then commenced searching operations. As each pair were searched, scrutinised and interrogated, they were allowed to wait some short distance away from those who remained to be examined. With my small attache case and bicycle beside me I was wondering who would be my companion when the time arrived. I had not long to wait. The fresh-complexioned young man, who had previously puffed the cigarette smoke into the Black and Tan’s eyes, and myself were ordered to stand up. The young fellow was about five feet seven inches in height, was of sturdy build and showed no traces of nerves or tension. While he was being searched by one, the other kept him covered with a revolver. The search appeared to be uneventful until, from his vest pocket, a small wisp of paper was extracted. This was very minutely scanned and, following a short conversation between the searchers, the officer looked intently at the young man and said: “So you were in the Custom House. What were you doing in the Custom House?” The young man, now proudly erect, clicked his heels sharply together and replied: “On duty”. The searchers immediately conducted him to a group of soldiers who were standing with fixed bayonets beside a military lorry. This brave youngster was then ordered into the lorry. In the general suppressed excitement, the searchers returned to complete their work. Another pair were ordered to stand up and, in the confusion, I took up my place with those already searched, without actually having been searched myself. When the searching had concluded, the heads of the several offices centred in the Custom House were sought out and asked to identify the respective members of their staffs. A door opening into the large store of Messrs. Brooks Thomas, just at hand, was then opened and the persons identified were allowed to enter. Actually, the process of “identifying” was not too strictly observed. I remember one young Civil Servant, who was standing with several members of the public, had not been called. He appealed anxiously to me to have him identified. “Come along” I said, and proceeded to the store. The young man, as well as those near at hand, immediately entered the safety of the shelter. We were a very shaken crowd in that store. Most of our faces and clothes were covered with dust and grime, but what a relief it was to feel walls between ourselves and the armed hordes outside! After an interval we were permitted to leave the store by a back passage which led into Lower Gardiner St. When we emerged into Lower Gardiner St., the place was thronged with people gazing at the Custom House which was burning fiercely. Some women were on their knees, praying; others were standing with rosary beads in their hands. The military had cordoned off Gardiner St. from Beresford Place. The area surrounding the Custom House from the Quay to Beresford Place, Store Street and onwards to Amiens St. Station was occupied by military with all types of military weapons. Crowds congregated on O’Connell Bridge watching the flames and smoke belching from the Custom House. The populace spotted and surrounded us as we entered Gardiner St. We were easily identified with our semi-wild looks and dust-covered faces and clothes. We were questioned and queried from all sides, one of our questioners being the late Fr. Phelan, the distinguished Jesuit preacher. It was a relief to escape to safety and the refuge of a frightened landlady. Members of the Custom House staff walking past the body of Dan Head. So who was Daniel McAleese ? He was born on 28 January 1890 in Ardmore just outside Lurgan, Co Armagh. His father James was a farmer & mother Mary was a housewife. Daniel joined the Civil Service in London in 1905 and was later transferred to Dublin to take up a position with the Revenue Commissioners which were based in the Custom House. He married Catherine Nolan on 21 September 1925 and had four sons – Donal, James, John & Joseph. He retired from the Revenue Commissioners on his 65th birthday in January 1955. He did not stay fully retired for long as he took up the position of Chairman of the Committee for Atomic Energy in March 1956. He passed away aged 76 on 7 April 1966, shortly before the 50th anniversary of the Easter Rising. His home address was given as “Melville”, Ballymun Road, Dublin. On the 75th Anniversary of the setting up of the Irish Revenue Commissioners, President Mary McAleese mentioned Daniel in her speech. “I know too of a former Commissioner – Daniel McAleese from near Lurgan – no relation, I hasten to add – who must also have had a robust constitution – because he founded the National Boxing Stadium!”. The Taoiseach, Mr Costello addressing the first meeting of the Atomic Energy Committee in Dublin yesterday. From left are: Mr J. Conroy, Professor M. A. Hogan, Mr E. F. Hall, Mr P. G. Murphy, Professor T. F. Walton, Lieut-Gen M. J. Costello, Mr E. J. Conway, Mr M. Moynihan, Mr D. McAleese and Mr J. J. Lennon. Daniel McAleese was an interesting character indeed and as I said in the beginning of this piece I think his opinion of both sides involved in the battle for the Custom House warrants serious consideration. Daniel’s witness statement is reproduced by kind permission of Irish Military Archives, Statement number 1411. Thank you – excellent piece of research. My father’s family lived close by in Ballymun Road having ‘relocated’ from Derry in the 1930s. An excellent piece. Well done.